Of all the types of office printers available, laser printers are often preferable for their printing speed and clarity. Sandia Office Supply has everything you need to keep your laser printers humming along, including all major manufacturer brands of toner cartridges. Our inventory also includes Xerox toner cartridges for a variety of photocopier models. 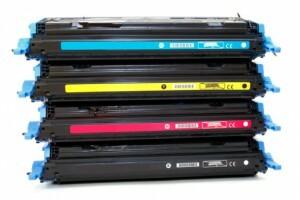 We carry remanufactured toner cartridges by most manufacturers, as well, to provide more cost-effective options. Sandia Office Supply offers next-day delivery at no extra cost, so you get the office supplies you need when you need them. There’s no minimum order, so whether you need one hundred new Xerox toner cartridges or just need an individual color cartridge for your single office printer, we can get it to you tomorrow! We are committed to sustaining the local economy and the planet. As New Mexico’s largest local office supply store, we are able to make our huge selection of general office supplies, breakroom supplies, janitorial cleaning supplies and more next-day available to our customers in Albuquerque and beyond! We have a Green-Only catalog that includes earth-friendly products, including toner cartridges. Contact Sandia Office Supply for Toner Cartridges and More! Our mission at Sandia Office Supply is to save you time and money! Open an account with us today for unmatched customer service that keeps your business moving forward. Contact us for more information. Call 505-341-4900 to order your toner cartridges from Sandia Office Supply of Albuquerque, NM today!